It has not been that many years since I used to work as a teacher of mathematics and computers in a junior high school. Back then it was considered as a common truth that every learner has her own way to learn. One learns best by listening, the other by doing and the third by reading. These are called auditory, kinesthetic/tactil and visual learning styles. This is probably the most common way to categorize learners, although there are other ways as well. I’ve based my teaching on these learning styles; every type of learner has to get some benefit from my teaching. Some time ago my superior determinedly announced that he disagrees with me: the learning style categorization is nonsense and it is more important to teach each subject in a manner that is the most suited for that subject. When you think about it, it does make sense. Have you ever learned the perfect skiing technique just by monitoring top athletes? Have you ever learned how to use an application just by listening to a lecture? I’ve been studying this topic since then and I’ve learned that researchers have not been able to prove the existence of different learning styles in studies and that there isn’t much evidence about the adoption efficiency of teaching according to learning styles. Studies show that all learners benefit more from the use of one good teaching method rather than the use of learning style categorization. What is the best way to teach IT skills? Everyone seems to have their own opinion. Sometimes even in the class room some trainees might emphasize the way they want to learn the subject I’m teaching. One thinks that the best way to learn the use of SharePoint is by listening to the lecturer. The other thinks that all the training should be done so that the trainer shows the actions with projector and all the trainees do the same actions on their computers. The third believes in mere practicing. Sure you can learn by those mentioned ways, but it takes a lot of time. If one must learn what is the difference between a SharePoint site and a site collection just by trial and error, one has to do some serious clicking. I strongly believe that a certain theoretical base helps the learning process significantly. On the other hand, one must assume and hope that people already have certain background information without overestimating their IT skills or the knowledge of IT terms. Know-how and doing can’t be taught just by lecturing theory. Training plays an important role. 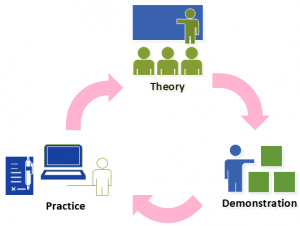 I believe that if learners do training sessions under the direction of the trainer – that is click at the same time as the learner clicks in the projector – nothing significant sinks in. This is a tempting way to teach; it is easy for the learner and saves the precious training time. Trainings are often designed so that as much information as possible is taught in the minimal amount of time. On the other hand I don’t believe in going straight to independent training after theory. I’ve gained good results by first showing how the application works and then let the trainees’ train independently. This way the learner has to think what she is doing and solve problems by herself; I can of course provide help if necessary. At least for myself, it would be very difficult to listen, follow, adopt, and perform at the same time. It takes skill to split for example a whole training day into suitable cycles so that the learners’ motivation and interest stay high. Morning lectures followed by demonstrations until the afternoon and then last hour’s practice is sure not to keep anyone awake. How long each part of the cycle should last and how many cycles there should be in one day? This is a part of training I’m going to monitor in the future to have as positive learning results and experiences as possible.